Editor’s Note: This post was provided by one of our paid sponsors, Ecomugs, a company that offers lead-free mugs as a green alternative to disposable cups, while at the same time providing a healthy work environment and support system for recovering alcoholics. Here is good news for offices taking steps towards going green – a blossoming company in California makes eco-friendly coffee mugs featuring your logo and employee name. There’s no minimum order required, so even the smallest startups can take advantage of Ecomugs handy dual purpose – the mugs are valuable promotional tools that also serve as a highly effective way to let your customers know that you are doing your part for the environment. Did you know that over 25,000,000 styrofoam cups go into landfills every year? Styrofoam makes up 25% of our landfill space and is not recyclable, so any cup you use today will still be around 500 years from now. Incinerating styrofoam is not an acceptable alternative to burying the impervious material, as it gives off over 90 different hazardous chemicals, including styrene vapors and dioxin. Ecomugs are made of lead-free ceramic and are personalized with water-soluble inks that are dishwasher safe. 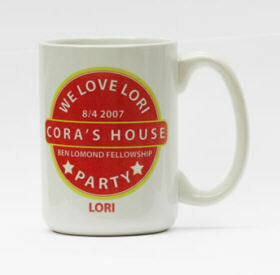 The company’s founder, Kirk Meyer, put together a system to economically imprint one personalized mug at a time. Meyer’s inspiration for Ecomugs came from a sign he saw in a hospital requesting patients and visitors to reuse their styrofoam cups. As we all know, styrofoam is made to be thrown away, and doesn’t hold up well to repeated use. He knew there was a better way to handle office coffee consumption. Meyer made the first few mugs himself and passed them out for free. His product testers liked both the personalization and practicality so much that it wasn’t long before orders began pouring in. Nowadays, Ecomugs employees are trained in-house and hired from local recovery centers and women’s shelters. Ecomugs is in talks with the nonprofit Safe Havens to create a women’s shelter in the Spring of 2008, complete with in-house employee living, mug administration, production, life and work training and 12-step fellowship meetings. Statistics for this article were taken from The Life Cycle of Styrofoam by Andrea Kremer, San Francisco State University, 2003.